The Galápagos Archipelago, Darwin’s living laboratory, is home to an abundance of wildlife. Isolated from the mainland for millions of years, it is that rare wilderness where animals have no instinctive fear of humans. Traveling aboard the National Geographic Endeavour or National Geographic Islander, experience up close encounters with unique species such as flightless cormorants, marine iguanas, and domed giant tortoises. 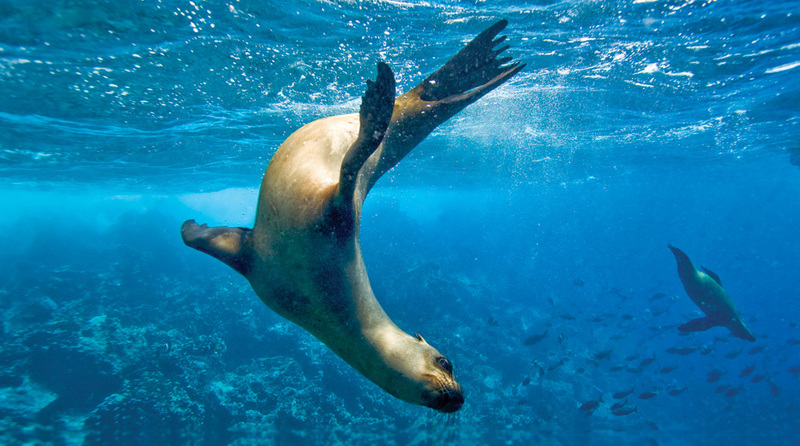 Snorkel amid shimmering fish, sea turtles, penguins, and playful sea lions. Cruise to pristine islands and walk among colonies of animals and birds unfazed by your presence. Observe rare giant tortoises at the Charles Darwin Research Station. Explore the waters of the Galápagos by kayak, glass-bottom boat (Endeavour only), or Zodiac. Depart for Guayaquil and upon arrival, transfer to our hotel. This morning, fly to the Galápagos Islands and board our comfortable expedition ship. During lunch, we begin our exploration of the islands and their diverse wildlife. In keeping with the nature of an expedition, our itinerary is flexible, allowing you to take advantage of this extraordinary wildlife sanctuary. You will have the opportunity to go on nature walks with local naturalists; swim; snorkel; or explore the waters by kayak, glass-bottom boat (Endeavour only), or Zodiac. Walk to the top of Bartolomé’s volcanic cone for a stunning view of Pinnacle Rock and the surrounding white sand beaches. You may also have the opportunity to swim with Galápagos penguins. Follow a path along a series of tide pools and underwater caverns in search of Galápagos fur seals, marine iguanas, sea lions, and Sally Lightfoot crabs. Santa Cruz is home to the Charles Darwin Research Station, a breeding station for endangered native species. Learn about the Darwin Foundation and their giant Galápagos tortoise breeding program. Later, travel into the highlands where wild tortoises forage. Spend the early morning on the lookout for dolphins, whales, sea turtles, and the unusual ocean sunfish, the Mola mola. Explore caves and hidden lagoons by Zodiac, and snorkel among sea turtles. At Champion Islet, snorkel among sea lions, or peer into an underwater world in a glass-bottom boat (Endeavour only) while keeping an eye out for the endangered Floreana Mockingbird. Those interested can visit Post Office Bay—if you see a letter addressed to someone who lives near you, the tradition is to deliver it by hand. Discover the marine iguana haven of Punta Espinoza as we hike over lava flows. Galapagos hawks and sea lion nurseries are also found as we explore this island. See Darwin’s finches, boobies, and waved albatross on this birder’s paradise. Walk among vivid green and red marine iguanas, and observe sea lions up close on a pristine white-sand beach. After breakfast, disembark the ship and fly to Guayaquil. The evening is at your leisure. Depart Guayaquil this morning, arriving home the same day. For a single cabin on the Endeavour II, add $1,990 in Category 2 and $2,190 in Category 3. For a single cabin on the Islander, add $3,660 in Category 1 and $4,150 in Category 2. Copyright ©2016 Travganic, LLC. All Rights Reserved. | Join Us | Terms & Conditions | Site by Kevin O'Neill.